The latest edition of Compass, the monthly newsletter from the Association of Investment Companies (AIC). The tree is up and Christmas and New Year festivities are fast approaching. Despite the shocks and surprises of 2016, overall it’s been a good year for our investors with the average investment company this year up 12% to end November. In Compass this month we are looking forward to what may be in store in 2017. You may be interested in the results of our fund manager survey. To quote Macmillan, ‘events dear boy events’ have taken over, with pressing geopolitical fears at the top of managers’ agenda. Yet most managers are cautiously optimistic on the outlook for equities and despite Trump’s unexpected win it seems the American dream remains alive and well amongst investment company managers with the US being the country most widely expected to outperform in 2017 and the next five years. 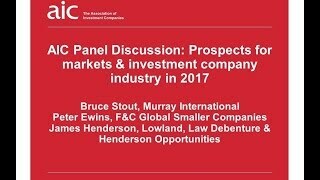 It’s well worth also looking at our panel discussion video on the prospects for 2017 with three very well-known managers, Bruce Stout from Murray International, Peter Ewins from F&C Global Smaller Companies and James Henderson, manager of Lowland, Henderson Opportunities and Law Debenture. Ever wondered why this investment company is called Monks? Well, Monks was one of three companies, including The Friars Investment Trust and The Abbots Investment Trust founded in the late 1920s and all three were named after the company secretary’s office on the street, Austin Friars in the City of London. In 1931 Baillie Gifford took over the management of all three companies and in 1932 Monks became a founder member of our trade association. The considerable history of many investment companies puts any short-term worries about markets or political events into perspective. Wishing you the best of luck with your investments in 2017. The American Dream in 2017? The AIC's annual fund manager survey finds managers more optimistic on the outlook for equities than a year ago, but with weighty concerns. As well as significant geopolitical worries, for the first time ever global warming cropped up as a major risk for equities. Some 77% of managers surveyed expect markets to rise in general next year, up from 60% a year ago, but still behind the 91% reported in 2014. Whilst last year managers were hedging their bets, favouring a range of assets (only 52% expected equities to outperform other asset classes), this year a more bullish 76% of managers expect equities to outperform other asset classes in 2017. The AIC received responses from investment company managers primarily from the Global and UK sectors representing £25 billion of assets. After the unexpected Trump win, it seems that the American dream remains alive and well. The US is the country most widely expected to outperform in 2017 amongst 40% of managers. It is also the country most widely expected to outperform on a medium-term (5 year) view (37%). Japan was the second country tipped to outperform in 2017 (20%), with Asia Pacific ex Japan and the UK in joint third place (10%). On a medium-term, five-year view, after the US, managers favoured emerging markets (21%) and the UK (11%). Whilst a year ago managers were mostly concerned about the weakening of developed markets, a possible recession and lack of ‘value’ in equities, this year’s concerns are somewhat different. Some 18% of managers cited a combination of political fears ranging from political breakdown of the EU and European political worries to protectionism/trade wars more generally. Some 14% of managers were primarily concerned by the possibility of rising interest rates. For 9% of managers, the effects of global warming presented the greatest threat for equities, whereas last year no fund managers selected ‘global warming’ as a possible threat to equities. A further 9% thought Brexit negotiations presented the single biggest threat to equities. Financials have come from being the third most favoured sector last year to the number one spot for 2017 (26%). Technology remained in second place (21%), followed by commodities and natural resources, which was the third most favoured sector for the second year running (16%). On a five-year view, technology was the most widely favoured sector by 22% of managers followed, in equal measure, by biotechnology/pharmaceuticals, financials and smaller companies (17%). The most likely causes for optimism amongst fund managers for next year were interest rates remaining low and increase in earnings (both 19%), followed by, in equal measure, strong balance sheets, equities still perceived as good value, better economic growth than expected and Trump potentially reflating the US economy (all 13%). In terms of where the FTSE 100 is most widely expected to close 2017, a quarter (25%) think the FTSE 100 will end the year between 6,500 and 7,000 and a third (33%) think it will end the year between 7,000 – 7,500. A pessimistic 8% of managers think the FTSE 100 will close below 4,000, with another 8% predicting between 6,000 – 6,500. A further 8% predict between 7,500 – 8,000 and a bullish 17% think the FTSE 100 will end over 8,000. "We expect active managers to have a better year"
Andrew Bell, Chief Executive, Witan Investment Trust said: “The world faces a range of uncertainties, ranging (parochially) from how the Brexit process will be handled to whether the new Trump administration governs more pragmatically than the rhetoric of the campaign trail suggested. We expect both of these factors to be more reassuring than the markets expected in autumn. "Less predictable is the outcome of the string of elections across Europe. At worst, they could threaten the future of the Euro and deliver a systemic shock to markets worldwide, but it is also possible that they encourage better economic and political management in the Eurozone, which would be a major fillip for European markets. “With the main problems being “watched pots” it is possible that equities, particularly in cyclical sectors, could positively surprise in 2017, as the shift in global economic policy towards more proactive fiscal policy could generate more support for economic growth after the recent years of relatively anaemic growth. Nonetheless, with valuations relatively high there are no windfalls from valuations so a selective approach is required. After the surprises this year and the rapid rebound in commodity sector share prices, we expect active managers to have a better year in 2017. "If Trump does what he says he will do..."
Bruce Stout, Manager, Murray International said: “Donald Trump has campaigned on a commitment to spend more on infrastructure, supported by a higher fiscal deficit, and to champion protectionist policies that will likely curb trade. If he does what he says he will do, this is clearly bad for emerging markets, especially Latin America which sends a bigger proportion of total exports to the US than any other developing region. “However, these policies will also have domestic consequences – higher inflation and ultimately slower growth are just two – which could force a reappraisal. There is some thought that Trump may tone down his rhetoric now that he’s secured the prize. While that remains to be seen, having control of both Congress and the Senate could prevent the gridlock we’ve seen over the past six years with President Obama. "The upside risk is that animal spirits take hold"
Paul Niven, Manager, Foreign & Colonial Investment Trust said: “Investors seem to be focused on Trump’s promise to cut corporate taxes and boost spending and appear to be assuming a pickup in growth, inflation and interest rates. There is a clear risk that the market is getting ahead of itself in terms of how much Trump will, ultimately, deliver. The outlook for the US economy and market was already improving and fiscal stimulus may be pro-cyclical – with the downside that monetary policy will tighten further if inflation expectations continue to rise. “Europe looks well placed to perform based on the broader macro environment and earnings are likely to accelerate from a structural trough but political risk is leading to elevated risk premiums. 2017 will present multiple new political risks in the Eurozone. Our base case is that Europe avoids systemic political mishaps in the next year. “Emerging Markets do face near term challenges but the underlying growth premium from that area will continue to expand. Overall, 2017 looks likely to see bond markets remaining under pressure which will probably mean that global equity ratings are also likely to decline. The good news is that the earnings picture is improving but, at the present time, it appears unlikely that this will meaningfully offset ratings compression. The upside risk is that animal spirits take hold and investors rerate markets on the back of better growth and higher inflation." "Good dividend growth from selective UK companies"
James Henderson, Fund Manager of Lowland Investment Company plc, Henderson Opportunities Trust plc and Law Debenture Corporation said: “The fall in Sterling will increase inflation and may lead to a rise in interest rates however, it will help certain UK companies export more overseas. Their competitiveness will be aided and cash generation will be strong. This will result in good dividend growth from selective UK companies." "Rarely a time when overhang from political uncertainty so significant"
Peter Ewins, Fund Manager, F&C Global Smaller Companies said: “There can rarely have been a time when the overhang from political uncertainty has been as significant as it is today for the financial markets. Against this backdrop, we have taken the view that holding a globally spread and sector diverse portfolio continues to make sense. At the margin, we have looked to moderate our exposure to companies with above average financial leverage, given the potential for interest rates to rise. We have also sought to take profits in stocks where valuation metrics look very extended by historic standards. Our focus remains on identifying those smaller market cap companies which have the inherent dynamic within them to deliver premium growth over the medium term. While at present compelling near term value is harder than usual to come by, we are still finding some stocks where we see good upside." Lucy Macdonald, Manager, The Brunner Investment Trust said: “We think there’s room for cautious optimism for 2017, with some positives and some negatives to consider. Overall, the economy seems to be showing signs of improvement, with some corporate earnings momentum and US tax reform next year likely to provide an additional major boost. “Our caution would be linked to the current level of valuations, which look more stretched now that bond markets have fallen, plus the fact that we’re going to see modestly higher interest rates, which could hamper economic growth. However, we’re expecting modest to positive returns overall for 2017 and, against that backdrop we think there’s plenty of opportunity to add value through stock selection." "A year of political and economic uncertainty"
Simon Gergel, Manager, The Merchants Trust said: “2017 is likely to be a year of political and economic uncertainty which makes it very hard to speculate about how the stock market may behave. It is possible to imagine a stronger stock market, caused by hopes for higher economic and profits growth, as inflation creeps back into the system. However, it is equally possible to make the opposite case, since rising interest rates could choke off economic growth. “Although the outlook may be difficult to predict, it is still possible to build a portfolio for these circumstances, finding investments that should deliver reasonable returns to investors over the medium term. It is particularly important to pay attention to the fundamental qualities and valuations of companies. We are looking to own strong businesses that are priced at attractive valuations, from which investors can expect to earn a decent return over the medium to long term. An attractive valuation is particularly important, as it can provide downside protection in a difficult stock market environment." "Too early to make strategic portfolio adjustments"
Tom Walker, Manager, Martin Currie Global Portfolio Trust said: “Since Trump’s election success, the move in long-term interest rates has been pronounced. The US 10 year Treasury yield has jumped, but only to the same level as a year ago. Investors feel Trump will be pro-growth and possibly inflationary. In my view, it is too early to be making strategic portfolio adjustments on the basis that a post Trump world is going to look very different. The multi-year bull market in bonds is possibly over but low growth and low interest rates are likely to continue. We will address investment decisions on the specific merits of each company we assess." A better home in uncertain times? Looking back on 2016, there can be few years where the prevailing consensus has proved to be so wrong, so often. Indeed, many predicted a torrid time for markets in the aftermath of Brexit and a Trump victory. Yet in reality markets have held up well. Closer to home, the investment company sector continued to build on the success it has seen over the past three years, with assets reaching another all-time high during 2016. In August, the sector’s assets broke through the £150bn mark for the first-time, an achievement even more remarkable as it only passed £100bn in January 2013. There are many reasons for this growth, but one key driver has been the sector’s ability to access specialist income-producing asset classes, combined with its unique ability to maintain and increase dividends in both good times and bad. However, before we get ahead of ourselves, we should bear in mind two things. "The sector does not exist to grow simply for growth’s sake. We exist to deliver returns to our shareholders." Firstly the sector has benefitted considerably from the fall in the value of sterling, given its significant worldwide exposure, and such gains can disappear as quickly as they arose. More importantly, though, the sector does not exist to grow simply for growth’s sake. We exist to deliver returns to our shareholders. So I am even more pleased that, in addition to these unprecedented levels of demand, the latest figures for November show the average investment company significantly outperforming the FTSE All-share over 1, 3, 5 and 10 years, delivering strong positive returns for shareholders across all these periods. With a year like 2016 nearly behind us, few of us would feel confident about making predictions about what the future holds in 2017. However, with interest rates cut yet again post the referendum result, I cannot see the demand for income waning any time soon. But I also wonder whether 2017 will be the year when the merits of the closed-ended structure receive true recognition. When I first got involved with the sector some 20 years ago, the distinction between a closed-ended and open-ended fund was often seen as something of a technical nuance. Difficulties in the open-ended property sector this year, where many funds had to close to redemptions or reprice as investors looked to exit this asset class, has reminded many of the genuine advantages of holding illiquid asset classes in a closed-ended structure. "I also wonder whether 2017 will be the year when the merits of the closed-ended structure receive true recognition." It is one of the reasons why, in our regular research on purchases by financial advisers through platforms, the Property - UK sector was the most popular sector for the first time since we started gathering this information. Of course, this structural advantage should be balanced against the fact that that gearing and discounts can add to short-term volatility and magnify losses. But my own view remains that, in these unpredictable times, it is better to have managers focussed on maintaining the best possible portfolio for the long-term, rather than having to keep one eye on current investor sentiment in case there is a rush for the door. As always, there are arguments on both sides but I sense there is growing recognition that building the best possible long-term portfolio is not simply about what you choose to invest in, but also which structure you choose to do it with. But whatever you decide, I hope that 2017 is a prosperous year for you, and perhaps also a little more predictable! The Monks Investment Trust adopts a long-term global equity growth strategy that draws on the broad research capabilities of over 100 investment professionals at Baillie Gifford. Stock selection is bottom-up with a focus on fundamental analysis. The trust, investing in around 100 stocks, is well diversified and very different from its comparative index. Stocks are picked on the basis of fundamental attractions, irrespective of location. Industry and regional exposure are a residual of the stock selection process. The focus is on companies that we believe could deliver above-average earnings growth. The portfolio is very different from the index with an ‘active share’ (defined as the percentage of the portfolio that does not overlap with the index) of approximately 90%. We are investors, not speculators. We expect annual turnover to normally be in the range of 20% to 33%, implying holding periods for at least three years on average. "We have an open-minded approach to growth"
Our core belief is that a company’s share price ultimately follows its earnings. For this reason, the trust invests in companies that offer the prospect of sustainable above-average growth. Over the long term, a portfolio of companies that achieves this earnings growth should deliver superior returns. We have an open-minded approach to growth; we recognise that companies grow at different rates, some more cyclically than others and we are also prepared to invest in companies with latent growth opportunities. We think our long-term investment perspective allows us to capture the more volatile growth from companies in a range of industries that other growth investors may overlook. We place all the stocks in the trust in one of four ‘growth categories’: stalwart, rapid, cyclical and latent, creating a differentiated and diversified portfolio with a high active share. Our job, as long-term investors, is to look past short-term headlines and identify those businesses that can sustainably grow their cash flows and earnings at above average rates. This perspective allows us to place short-term news and events firmly in context, stick to our approach and add value over the long term, using gearing to take advantage of indiscriminate market weakness by purchasing equities at attractive valuations. This in part explains why we made very few changes to the portfolio as a consequence of the ‘Brexit’ vote nor undertook any knee-jerk reactions following Mr Trump’s electoral success in the United States. Whilst picking individual stocks remains at the heart of what we do, there are three broad exposures about which we are enthusiastic. The first is Asian consumption; with around 100m consumers entering the Asian middle class every year, we believe there is a good deal of opportunity for companies in China and beyond to grow strongly. Second is the continued underlying growth of the US economy. The third exposure is related to companies that use technology and innovation to disrupt existing traditional business models – online businesses, the use of the cloud, better use of data which is being crunched by ever more advanced computers and the prevalence of mobile telephony; all are creating some major changes in the world to the advantage of many new emerging businesses. We believe that the Monks portfolio is set to grow at an above average rate, even in an environment of only modest economic expansion. The broad spread of investments ensures a natural diversification while the clear structure of the portfolio provides a framework which helps both analysis and decision making. There will be periods when fundamentals are not reflected in shareholder returns, such as when our growth style is out of favour. However, we remain confident that our process could create significant value for investors over the long term. Finally a word on costs. We are keen to ensure that investor returns are not eroded through excessive costs. Monk’s annual management charge is 0.45% and the annual ongoing charges figure at Monks’ year end was 0.59%. We believe that investing in global growth stocks from different perspectives, along with the attributes of low-cost and long-term active portfolio management, results in Monks’ portfolio potentially being a suitable core investment around which an investor’s portfolio can be built. The views expressed in this article are those of Charles Plowden and should not be considered as advice or a recommendation to buy, sell or hold a particular investment. This article contains information on investments which does not constitute independent investment research. Accordingly, it is not subject to the protections afforded to independent research and Baillie Gifford and its staff may have dealt in the investments concerned. Investment markets and conditions can change rapidly and as such the views expressed should not be taken as statements of fact nor should reliance be placed on these views when making investment decisions. The investment trusts managed by Baillie Gifford & Co Limited are listed UK companies. The value of their shares, and any income from them, can fall as well as rise and investors may not get back the amount invested. Monks invests in overseas securities. Changes in the rates of exchange may also cause the value of your investment (and any income it may pay) to go down or up. Monks can borrow money to make further investments (sometimes known as “gearing” or “leverage”). The risk is that when this money is repaid by the Trust, the value of the investments may not be enough to cover the borrowing and interest costs, and the Trust will make a loss. If the Trust's investments fall in value, any invested borrowings will increase the amount of this loss. Monks can make use of derivatives which may impact on its performance. All information is current and is sourced from Baillie Gifford & Co unless otherwise stated.